This popular brief text for the American Government course emphasizes the historical development of the American political system, who governs, and to what ends. 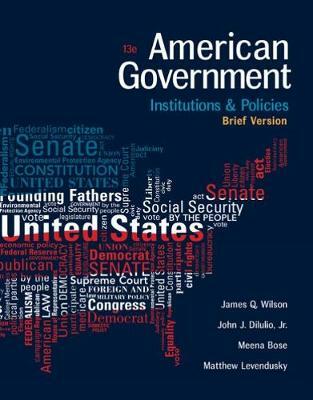 Thorough yet concise, the thirteenth edition of AMERICAN GOVERNMENT: INSTITUTIONS AND POLICIES, BRIEF VERSION, offers insightful coverage of all aspects of U.S. politics, including the Constitution, civil liberties and rights, Federalism, public opinion, the media, political parties, elections, the three branches of federal government, bureaucracy, and policymaking. Completely up to date, this edition includes new coverage of the 2014 and 2016 campaigns and elections. It also emphasizes critical-thinking skills and includes tools to help you maximize your study efforts and results, such as Learning Objectives in every chapter.